It's that time of year again - actually, it's almost that time of time of year again. 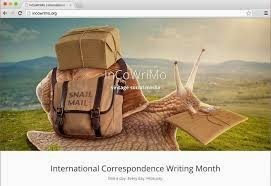 The official month of International Correspondence Writing Month is February. However, since I discovered InCoWriMo on Feb 12th last year, and had to double-time to catch up, this year I'm starting roughly three weeks ahead of time, and I know I'm not the only one. When this year's list went live last night (1/7/15), at about 9 PM Central Time, Carl Wood, Providence, R.I., USA, was the first to add his name to the list. I added mine about three hours later, just managing to slide in ahead of my pen pal friend, Bill Milling. Before I retired for the night, I penned a letter to Carl Wood, and before this day is over, I'll write two more letters - One to Heath Cates of Auburn, Alabama, USA, and the other to Tim Bennett, Rotterdam, The Netherlands. InCoWriMo is about writing one letter every day for the month of February. However, I'm not the only one that writes outside the specified month - in fact many of us correspond year around. I discovered fountain pens and letter writing way before InCoWriMo, or, for that matter, the internet existed. Fountain pens and I go back to 1967 and halfway around the world, to Vietnam, where I found a Sheaffer pen in a PX. Fountain pens were made for correspondence, so they are a natural for InCoWriMo, but certainly not a requirement. Mimi Boothby writes her letters to me with a brush pen, Stephen Woodfin uses a legal pad and whatever writing instrument is close at hand, and Maggie Kimura uses a ball point. The letter is what matters and the fact that it is handwritten is what makes it special. If you're up for a wonderful "vintage social media" experience, check out InCoWriMo - You won't regret it. And, if you wonder who to send your first letter to, send it to me, then begin watching your mailbox for my reply.